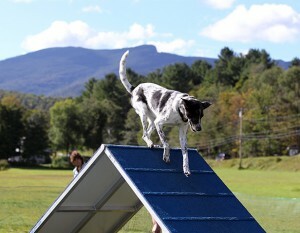 Our Stowe Camps take place at the Mountaineer Inn, located on 8 grassy and shaded acres bordered by a brook. It’s a relaxing setting where our very own Taffy Morgan serves home-cooked food second to none. These camps offer a variety of activities daily. There’s a fabulous, easy 5-mile walking path, gondola rides for you and your dog, great shopping, horseback riding and tourist attractions like Ben & Jerry’s in the area. Off-site accommodations, available upon request, welcome us and our dogs and provide a chance to get away from the hubbub of being on site. Click on the Mountaineer Inn website to see the accommodations www.stowemountaineerinn.com. Limit is 100 people. Campers must be 18 or older. If you would like more information please email or call us at 630-659-8771.